Pruven Pet Hair Roller:,Removes pet hair easily without damage,Tears cleanly,For use on pants, coats, sweaters, dresses, suits, formalwear and more,Optimal adhesive for no damage,Pruven Pet Hair Roller is the fast, easy way to keep clothes and fabrics looking neat, clean and pet-hair free. 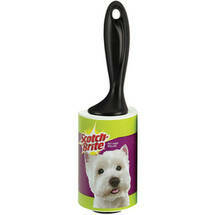 It's the only pet hair roller made with Scotch Brand adhesive. It removes pet hair from clothing and other fabrics. It sticks to pet hair and lint but not to clothing. Optimal adhesive removes pet hair without damaging fabric. And, it tears cleanly.